There are different bird house dimensions for different species. To attract the species you desire you will need to construct your bird house with specific sizes for the box itself, entrance holes and the species desired height placement above ground. Using the correct bird house dimensions will also help to exclude undesirable species, i.e. house sparrows and starlings. *These species species use a nesting shelf (3 sides and an open front) or a platform instead of a closed-box design. **If the Osprey platform is placed inland, the height should always exceed the height of any nearby trees or 20 feet whichever is greater. Using the right dimensions for your bird house is a good start to attract certain species, but you will also want to do a little research as far as placement. For example, if you install a bluebird house under trees as opposed to an open area, like a grassy meadow, your chances of having occupants will be greatly reduced. 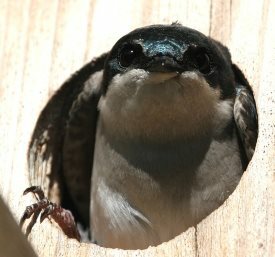 If you follow the links below to specific bird house designs, there are more tips according to species. The video below shows you how to build a bird house from scrap pieces of wood and offers some tips on construction. The ornithologist also explains why the decorative bird houses you buy from your local knickknack store isn't always best for the birds. Hope you enjoy building your bird house and its future occupants!